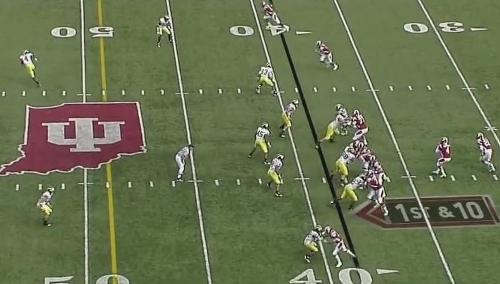 As I continue my crusade to see more man coverage from the Michigan defense, I want to take a look at a specific play from the Indiana game on which Michigan was successful running it and why it was successful. 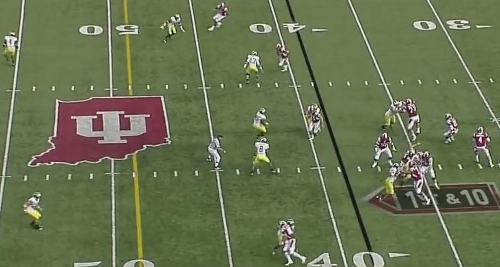 Indiana is in a three-wide pistol look with with a half back and H-back in the game. Michigan is in their base formation with base personnel. 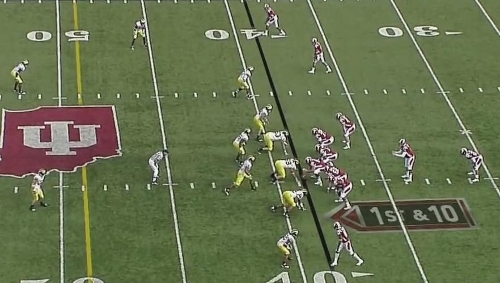 Michigan is going to play straight man coverage with cover-2 safety help over the top. Jordan Kovcas is covering the weakside deep half and Cam Gordon is over the strongside deep half. JT Floyd and James Rogers are covering the wide receivers with Rogers playing six yards off the line of scrimmage and Floyd play bump and run coverage. Carvin Johnson is shaded over the slot receiver and will play man coverage against him. Roh is rolled up to the line of scrimmage and is responsible for the H-back. Jonas Mouton and Obi Ezeh are spying Chappell and the running back. On the snap, the H-back releases right away. This is Roh's man to cover. The half back will step up in the pocket to help block. Floyd has jammed his receiver at the line while Johnson and Rogers are playing softer coverage and waiting for their receivers to head upfield. Roh is engaged with the H-back and has defensive help from the other linebackers. Floyd is still jamming his receiver. Johnson is close to the slot receiver and in good position to make a play on the ball if the pass comes. Rogers looks like he's out of position but he's not: he's baiting Chappell to make a throw from across the hash to the other sideline, a long pass that he should be able to pick off. Ezeh and Mouton continue to spy the men in the backfield. This is where the play really comes together. Indiana had been running plays like this all game to great effect. They'd send multiple receivers into Michigan's defensive zones and have them sit down or cross through them (as the H-back is doing here). When Michigan finally broke that tendency, Chappell was caught by surprise. He was expecting to be able to find one of the various soft spots in Michigan's zones and pick up five yards. Because Chappell was caught off guard and was unable to make the timing throw he expected, Michigan's three-man front is able to get pressure. Mike Martin gets off his block and into the backfield forcing Chappell to roll out to his right where Ryan Van Bergen is waiting. Though it looks like the wide receiver that Rogers is covering is still open, Rogers is actually continuing to bait Chappell to make the cross-field throw. In the end, Chappell throws the ball away. This is a perfect example of why Michigan needs to play more man coverage: it's not necessarily that it will be more effective than the zones that they currently play, but it will make Michigan's defense less predictable, forcing QBs to go through more reads and give the pass rush more time to deliver. Imagine if a team ran an I-formation halfback iso on every single play on offense. They do it over and over again, game after game, and defenses start to adjust to it. Despite opposing teams figuring out the play and stopping it effectively, the offense keeps running it. Suddenly they run a play action pass and catch the defense off guard. It's the same concept here, except surprising an offense with man coverage once every 8-10 plays isn't going to get a team very many stops, and it's not going to return the same kind of results that a play action pass might. If Michigan can commit to playing man coverage more frequently, I think you'll see the defensive performance spike despite not having the kind of elite-level talent teams need to play a significant amount of man coverage. Dude - this isn't man coverage, unless both Roh and Mouton got assigned the same guy, and Ezeh got assigned the ref. One problem: This isn't man coverage. Note how everyone's eyes are on the QB, not their "man." And Floyd is letting his guy go after he gets the jam. This is a cover 2 with Rogers in a hook zone. Maybe it's even Tampa-2, hard to tell what Ezeh's doing without the video. That said, this is an example of how it could be beneficial for Michigan to jam a receiver at the line every now and then - and it shows that they don't have to jam both guys for it to be successful. I'm not sure. Johnson is very clearly playing his man, so is Roh, who carried the H-back across the field until Chappell started rolling away from him. 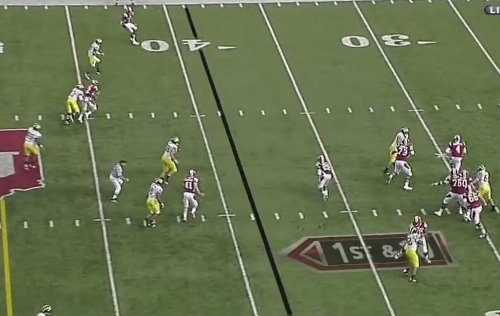 Man coverage is going to look different on these short hitch routes than it does on downfield routes. Defenders are going to look in the backfield at least temporarily after the short route is completed, which is what you may be seeing here. There almost certainly is a zone aspect to this play (the safeties over the top, for instance, and probably Ezeh and Mouton), but there are man aspects as well: Floyd's receiver jam, Carvin Johnson, and Roh extending across the field. I'll rewatch and report back. They're not just "peeking" in the backfield, Chris, it seems like the entire secondary is staring at the QB. This looks like zone to me. 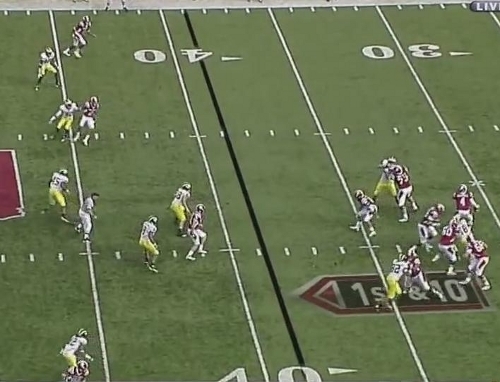 Perhaps this isn't the best example of man coverage if you're not even sure it's man coverage to begin with.